The support requires no adhesive/cement. 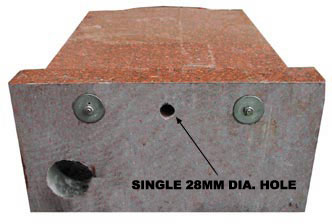 It locates within the holes DRY. 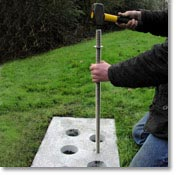 This makes removal and re-fixing of the memorial and foundation very simple. 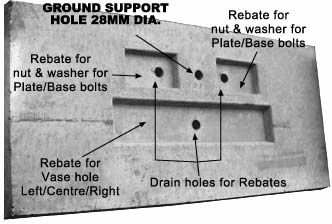 The support can be removed and re-used as required. Centrally positioned side to side, underneath the memorial plate. In effect, a third dowel. Position the memorial onto wooden skids. 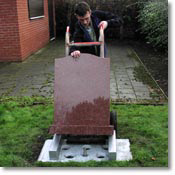 Lower the memorial over the support rod by reducing the skid sizes, or alternatively use slightly lower skids and slot the support rod onto the skids. Cement the base to the foundation and remove the skids to fix.